Hi there! Hope this post finds you well and enjoying your life. It's Thursday, so that means it's time again for Photo Art Friday! 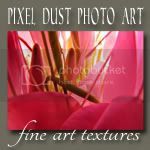 Our virtual art gallery opens its doors early to accommodate our photo-artists in other time zones. Hard to believe that it has been two months since our last virtual photo-art showcase. The doors to our virtual gallery open Thursday and close Saturday. That gives you lots of time to create or select a piece of photo art to share, if you have not done so already. 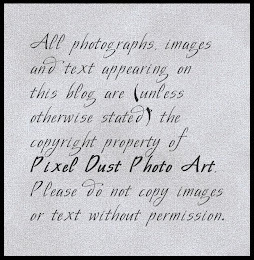 If you are new to Photo Art Friday, you can read the guidelines for participation here. Regulars will recall that you are always welcome to feature any piece of your photo-art here ... AND, if you wish you can create some photo-art in line with the optional theme. The optional theme for this edition of Photo Art Friday is: DREAMY or ETHEREAL. Before displaying my photo-art, thought I would share some of my recent creations from playing with paint. Actually, these photographs are now from a couple of weeks ago. 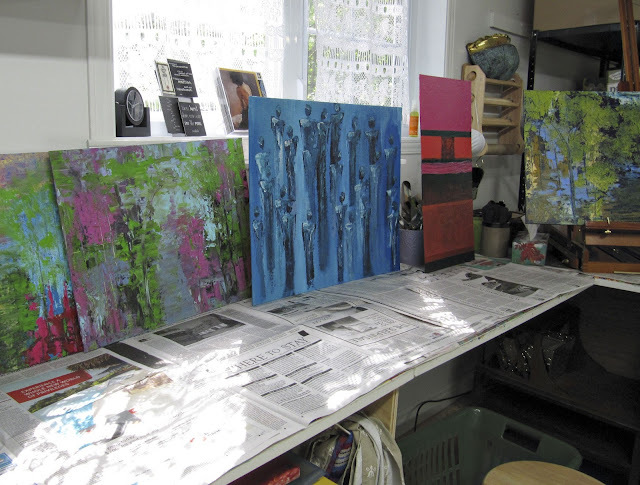 A peek at one of the work tables in the studio. 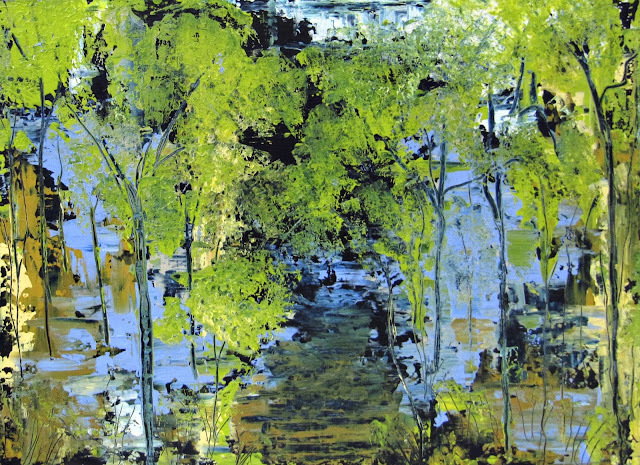 This quasi abstract image was created using only a metal spatula - slapping areas of colour on the canvas and then carving the trees and branches into the colours with the corner of the spatula. The path was created by simply smoothing the area with the spatula and the leaves were made by patting the spatula up and down on the areas. Yes, I had to add some green blobs of paint to the canvas in the appropriate areas for those leaves. This piece hardly qualifies as a painting - not sure what to call it. When I completed this piece it reminded me of something but I could not put my finger on exactly what it was. Then my son said it looked like native American Indian totem art - the kind seen in British Columbia. That was it! Unplanned cracks appeared in a lot of the paint due to a glossy 'pouring' medium used to thin the paint. I actually love all the cracks. No brushes were harmed in the making of this piece! All the paint was poured onto the surface. Guess I should call it a 'pouring' rather than a painting! 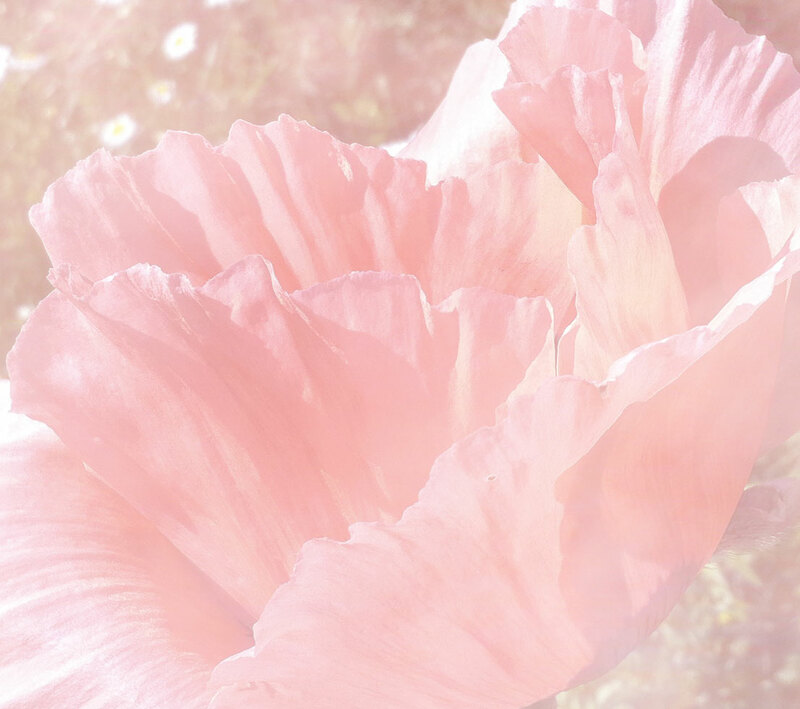 A coral-colored poppy made pink and dreamy with simple edits in Photoshop Elements. 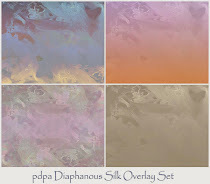 To achieve the dreamy look I played with a pale gradient fill - among other manipulations in Photoshop. I have decided to have only one Photo Art Friday per month - on the first Friday of every month. This new schedule will begin on Friday, August 2nd. I'm skipping July for health and holiday reasons. This could turn into a useful project that can be used as a background or header for your blog/website; business cards; shipping labels; etc. etc. This may seem like a big project, but you have about six weeks until August 2nd to create something using your photo-art, your editing skills to make a collage sample of your photo art, and featuring as much or as little 'self-promotion' (3 choices above) as pleases you. Awesome work, Bonnie!! And good for you scaling back PAF to once a month. I've missed and will miss you, and yet I will also BE deLIGHTed to play. Your art is so inspirational! What a great gift you have! Nice to have you back!!! I love the paintings, great design, textures and colors!!! Wow, you have been so busy painting and I love the quasi abstract. I have missed PAF and am glad you are going to continue. Have a wonderful weekend. You have been one busy lady... Thank you for sharing your lovely art with us! Well, this is PAF so I should comment on your beautiful Coral Poppy ... you have, of course, captured exactly what "dreamy and ethereal" is. You make it look so easy which shouldn't surprise me because you do it every time. As for your artwork ... I can't imagine how you can tear yourself away from it long enough to play with us. These pictures are wonderful. The path picture is exactly like a painting my mother did of a path that we used to follow to the beach in Florida. Hers is a realistic pastel, but the essence was captured in you painting ... it touched my heart. As for the Totum Art ... again you have hit home and it is beautiful. I have just a smidge of Native American in my background, but enough to make me interested and inspired by theit art and thier spirituality. Great Post Bonnie ... love having you back. 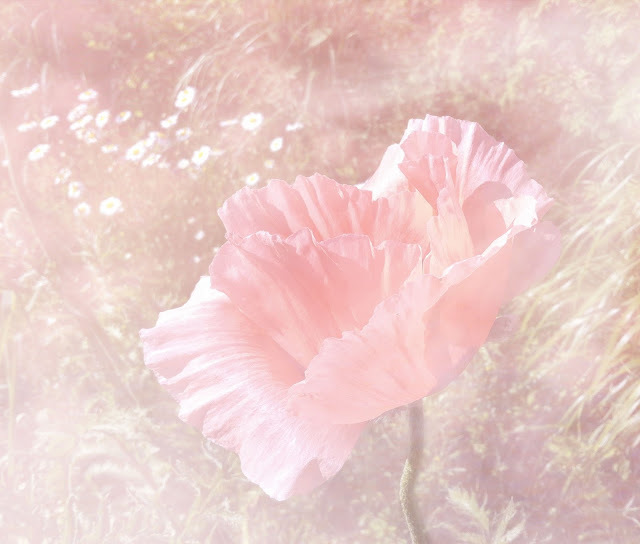 The poppy is ethereal and dreamy. 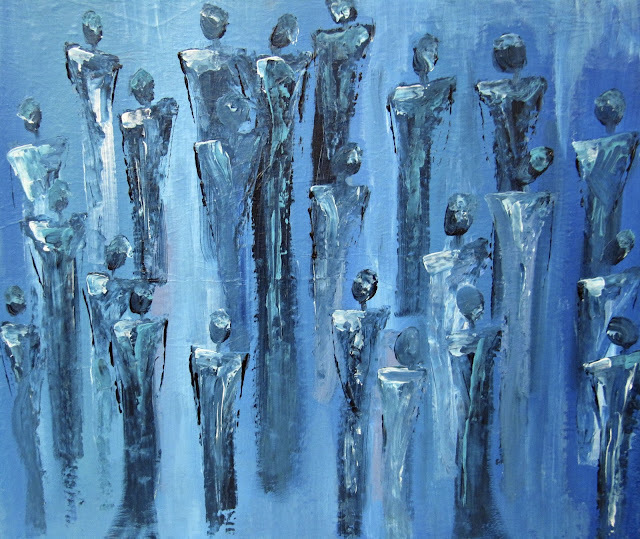 I like the blue people and the path paintings too. Did a little happy dance when I saw Photo Art Friday was back. Glad you've been able to do the work you've been wanting to do. Even once a month...it's wonderful to have! Thanks for bringing it back! I do LOVE the blue "figure" painting! And your pink poppy is truly ethereal. (I planted seeds from both red and pink poppies last fall...I have plants that have big buds, but no indication of color. Oh, how I hope that at least one is pink!) Thanks for the opportunity to make art with our photos. your art! Have a good weekend. Love your spatula painting Bonnie! What a wonderful tool to experiment with and fantastic results. Your people painting reminds me of the cave painting of our ancestors. I've always been partial to them. Yet at the same time, it looks futuristic. :-D Great job! I love your work and especially you call "dumping". This technique is also painting, and many artists use it. I myself in my youth I used, but of course not as masterfully as you have done! Good job! Great to see that your creative juices are flowing (or should I say "pouring"?) out of you! You and I seem to be moving in opposite directions as I drift away from paints and get more involved with pixels. Enjoy your summer! 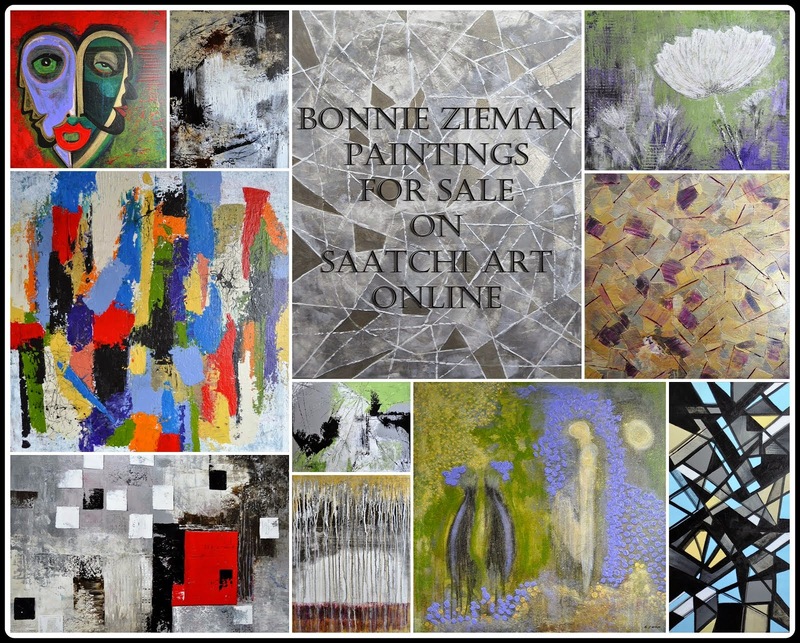 Welcome back Bonnie, It was wonderful to see your paintings, The blue one I find fascinating but my favorite was the tree piece. It reminds me of birch trees and is just lovely. So was your poppy piece. I love poppies and have several varieties in my garden. Such a lovely soft shade of pink and indeed dreamy looking. Good to know PAF will still be around. I love the pour and the poppies! So happy to be back sharing in the amazing gallery, Bonnie. You have been busy and produced such amazing pieces. My absolute favourite is the blue work in progress. Your artwork is beautiful. I especially love the first painting. Glad to see the return of PAF! So nice to be back with PAF! I love seeing your paintings - they're wonderful! My favourites are the blue one and the abstract path. Great dreamy images, too. So glad to see you back this week Bonnie, your art is just wonderful, and so inspiring. I love the blue people and thank goodness I don't have to choose just one.